PERFORMANCE - Cuts like natural sheepskin but finishes like a foam pad. Aggressively removes P1500 grit scratches, leaving a lustrous finish with no hazing by reducing compounding swirls. DENSE BODY - Foamed fibers resist caking and matting. Foaming process also creates minute air pockets at the base of the fibers, which improves cushioning and retention of compounds and polishes. 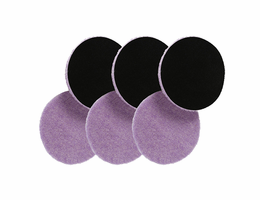 CONSISTENT QUALITY - Manufacturing process produces a uniform material, resulting in consistent pad performance ... unlike performance reducing variances that can occur with natural sheepskin pads. MINIMAL LINTING - Foaming process locks in the lambs wool fibers, significantly reducing linting. APPEARANCE - Distinctive color for easy identification. Pack is for six 3 ¼ x 1/4" pads.